Crazy quilts are among my most favorite sorts of quilts. 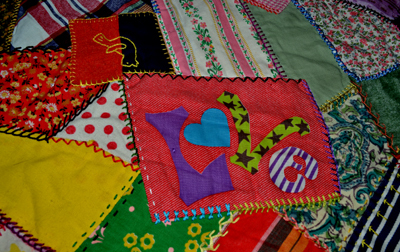 They can be done quite spontaneously with little planning and provide the quilter a chance to display her love of stitching. 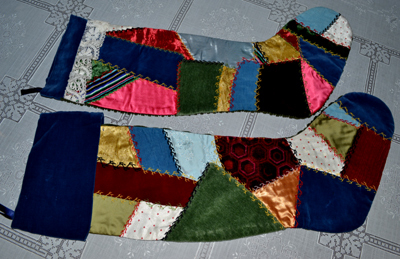 I did my first crazy quilt when I was in college. Instead of using fancy materials, I simply collected discarded or donated fabric scraps from all my sewing friends, clothing tags and pieces of my favorite worn out, dated or outgrown clothes. Even a bit of my Blue Bird vest from my childhood was added to this quilt. I simply stitched them in an overlapping and crazy fashion to a bed sheet using a whip stitch, turning the exposed edges under as I went and then added plenty of embroidery stitching along the seams with different weights and colors of embroidery threads! It was fun and easy and made a great long term and inexpensive project for a young sewer, needing to practice hand and embroidery stitching. 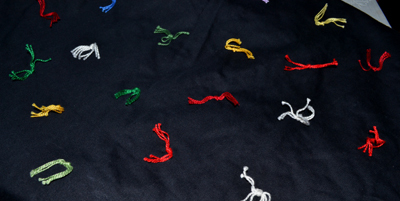 I am still working at tying a black cotton backing to it using all a variety of colored pearl cotton threads and have tried to match these ties to the front fabrics, so as to not distract from patchwork and fancy stitching. I do have a hard time finishing quilts as I love to start new ones! 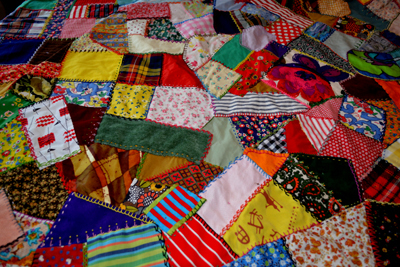 Some people have their quilts professionally quilted or tied by others as they too prefer to design and do the patchwork, than the quilting or the tying. 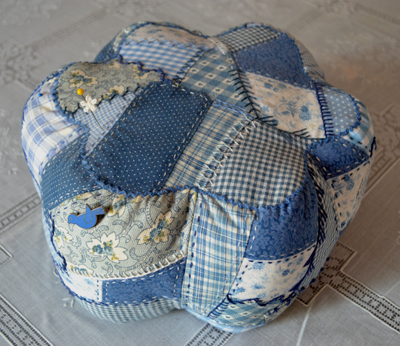 I did learn the hard way that crazy quilting is often done in smaller quilts and throws as when you add a backing to cover the backside of your patchwork and stitching, your quilt can become quite heavy. I was initially going to use a heavier and richer fabric for the back but then my quilt would have been too heavy to use. My quilt was done very spontaneously with only some attempt at balancing colors and working to be sure to add a variety of materials, colors, shapes and sizes in the pieces added. Some crazy quilts are more carefully planned with subject themes executed in the embroidered details as featured in the blog, A Crazy Quilt with a New Twist, or with more conformity in the sorts of fabrics used. Whatever you prefer, anything works! Crazy quilts are fun to do as there is no mundane repetitiveness as found in other sorts of quilts where all blocks are similar or even the same. It is also a chance for us fabricaholics to enjoy the vast array of fabrics, new and old alike. 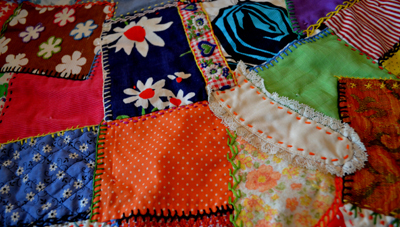 Stitched into my quilt were many memories of my life in the 60’s and 70’s. You will even note the dated "hippie LOVE" fabric. These are the details that make a crazy quilt personal to the quilter sewing them. I often took it with me and stitched on it while I sat with my family and friends to visit, or watch TV. 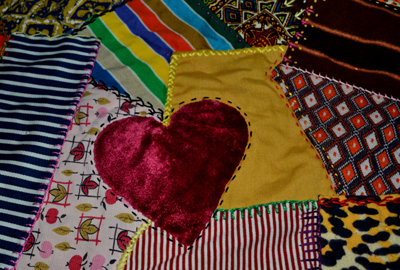 Quilts are treasures of memories both in the fabrics shared and used and the people surrounding us as we stitch! Crazy quilting can be used in smaller projects. 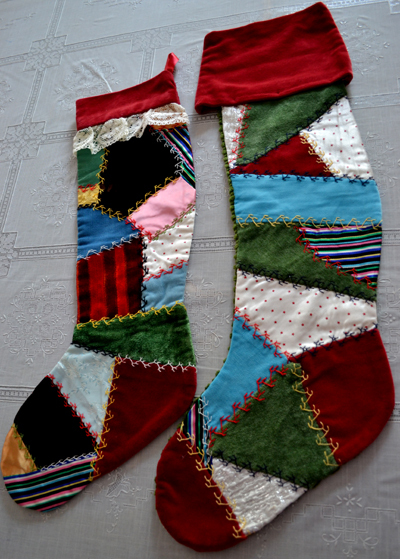 Years ago I did crazy quilted Christmas stockings that are now part of our yearly Christmas tradition. The laced trimmed ones are for the ladies and the wide cuffed ones for the men. 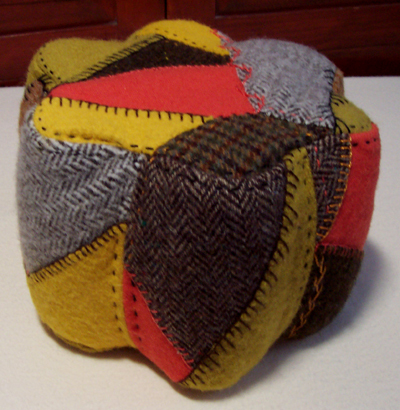 I have also used crazy quilt technique in designing my pincushions, and tea cozies! 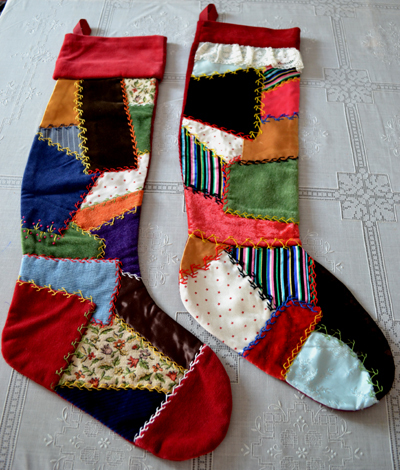 For sewers that love to do embroidery work, it is a good way to use your left over material scraps and threads! You will note that I have used fancy materials as well as cottons or wools for these projects. Don’t be afraid to create your own crazy quilted pillows, bags, throws and quilts from whatever fabric you have on hand. Get loose and enjoy the process as you stitch away! (The tea cozie and wool dressmaker/hat pincushion in this blog are for sale and may be found in my ETSY shop. 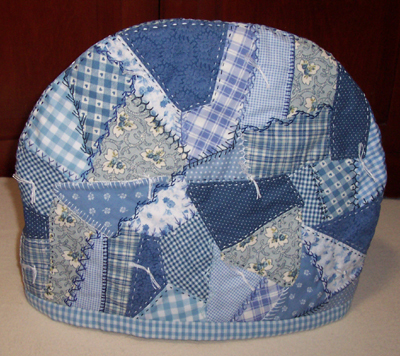 Any crazy quilted smaller items may be special ordered by contacting me. They do take time to create and cost a bit more as their beauty and value is in the hand-detailed embroidery work.